I had not planned on visiting Santiago, but here I was a year later visiting my friend Denny Almonte. We had gone to the same high school and he now was living in the Dominican Republic’s second-largest city in the mountainous north region. I had wanted to finish my Dominican trip in San Pedro de Macorís. However, I made a last-minute decision to visit Denny because I figured he could use the company. I had stayed at his place a year ago when I was covering the Caribbean World Series. 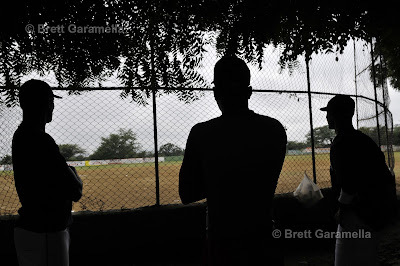 Cuban prospects look out to a baseball field before a morning practice in Santiago, Dominican Republic. From left to right: Angel Argüelles, Alexei Gil, and Felix Perez. I had not planned on doing laundry. I figured a few days with no underwear wouldn’t hurt. Denny knew a good place to do laundry in a small plaza close to his home. I had not planned on eating in fancy restaurants, but now that I was living with Denny it was unavoidable. A laundry mat worker recommended a restaurant for breakfast at the far end of the plaza. Felix Perez, 20, a centerfielder who played professionally in the Island of Youth in Cuba, takes morning batting practice as agents, his fellow Cuban players, and locals watch in Santiago, D.R. I had not planned on meeting any Cuban players, but I couldn’t resist the urge to talk to the tall young men at the restaurant eating breakfast in baseball uniforms. I walked up to the tallest player, who was wearing a Cubs hat and on his way out the restaurant. He told me his name was Angel Argüelles, and that he had grown up in Habana and pitched for the Metropolitanos. He said there were seven other Cuban players who had defected that were living in Santiago. They were going to tryouts so that hopefully they could be signed once they gained Dominican citizenship. Argüelles and some of the other players had been living in a hotel next to the restaurant while rest were living in an apartment. There was a group of men who lived in Santiago and knew prominent Major League agents. These men paid for the hotel, clothes, food, and good lifestyle that these prospects now enjoyed. When the players sign contracts, however, it will likely be worth the wait. It is kind of crazy when you think that the players have all been living in Santiago for six months or longer. It is even crazier to think about the lifestyle change for these young Cubans. I shook hands with another player, Felix Perez, and the benefactors. The players seemed excited I had a camera. When Perez asked Denny who I work for, Denny quickly replied, “For whoever he wants.” We began talking about Cuba and I showed them some of my photos on the computers inside the restaurant. We agreed to meet the following day so that I could photograph them. 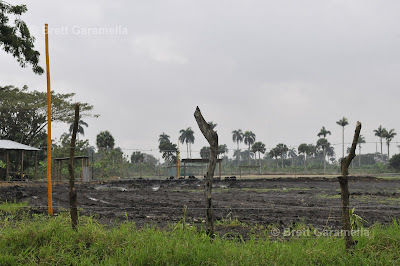 A baseball field outside of Santiago, D.R., owned by Tony Peña. I had not planned on following an old Toyota Camry down a muddy road in the middle of cow country. The benefactors had obviously spent all their money on fancy watches and hotel rooms for the players. Then again, it was probably done on purpose. They wanted to maintain a low profile. Denny’s dashboard was beeping because his gas needle was on empty. Outside it was drizzling and two quail ran around a big puddle in the road. There wasn’t a person anywhere, just a couple of farm houses. Sure enough there was a baseball field on the right side of the road, supposedly owned by legendary catcher Tony Peña. There was a batting cage, too. It was a “field of dreams” in its own way. However, it was too muddy to practice. 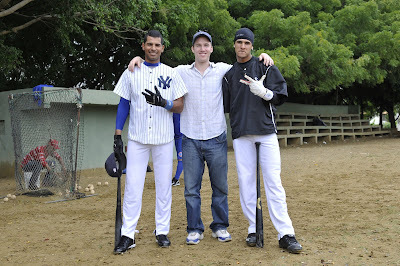 I am posing with two Cuban baseball prospects. Felix Perez is wearing a Chicago White Sox uniform that he says "was a surprise" gift from an agent or scout. Ironically, the Chicago Cubs are very interested in signing him. I forgot the name of the player wearing the New York Yankees uniform. Both players grew up in the Isla de Juventud, or Island of Youth. We turned around and followed the Camry back toward Santiago. Luckily, we didn’t run out of gas by the time we arrived at a better looking baseball field. As three of the players looked onto the field for a morning practice I took a photo that I believe was my best of the entire trip. (You can see it at the top of this blog). A group of local boys helped toss balls for batting practice and outfield drills. It was a good support system for these Cuban players. 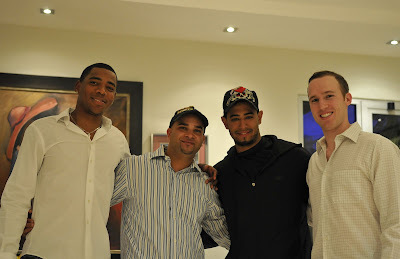 Before going out during my last night in Santiago(from left to right): Alexei Gil, Denny Almonte, Tony Peña Jr., and me. That night Denny and I returned to the plaza and saw some of the players sitting at the restaurant patio. We joined them and I gave them copies of the photos I taken and burned onto a CD. Denny and I had planned on going to the gym to workout. We ended up staying for drinks with the players which turned into smoking Cuban cigars and going out for the night. The stories these players had were remarkable and too long to write about here. Maybe it was the alcohol or the Cohibas, but they talked open and freely in a way I had never seen at a public place in Cuba. When they said they how much they wanted to go to the United States, I could see it in their eyes; their anticipation was palpable. Funny, because the next day I was leaving for the U.S. yet I wished I had more time in the Dominican Republic.